Rock and Roll Hall of Fame guitarist Carlos Santana has announced he will hit the road with his band across North America this summer for the Supernatural Now tour. The three-month, 29-date celebration will commemorate two of the most important milestones in the iconic guitarist's career: the 20th anniversary of his groundbreaking, multiple Grammy-winning album Supernatural and the 50th anniversary of his momentous performance at Woodstock. Reflecting on the cosmic significance of both anniversaries occurring in the same year, Santana says, "Both were monumental moments in my life. Woodstock and Supernatural took me to places I never dreamed were possible. I embraced those incredible moments in my life with all my heart. Both were supreme lessons in maintaining focus, heart and integrity in every step every day and to strive to better oneself with a high standard on and off the stage. I cannot think of these two moments without thinking about Mr. Bill Graham and Mr. Clive Davis. They are two of many angels in my life that helped shape my career." The 1999 album Supernatural was an unparalleled success and a watershed event in Santana's career. Containing the back-to-back No. 1 singles "Smooth" and "Maria Maria," the album sold over 30 million copies worldwide, topped the charts in over a dozen countries and swept the 2000 Grammy Awards, winning a record-tying nine Grammys including Album of the Year, as well as three Latin Grammys including Record of the Year. "With Supernatural, I felt I had a masterpiece of joy in my heart," says Santana. "While we were creating the album, I knew we were touching upon something inspiring and that we were creating music that was timeless, like Marvin Gaye's What's Going On or Bob Marley's Exodus. But no one was prepared for the Supernatural spiritual virus that moved across the world. The album touched little kids and grandparents and all points in between. I am very grateful to Clive Davis for helping me craft this seminal album that is still as relevant and infectious as the day it was released." "We are honored and humbled to be celebrating the 20th anniversary of one of the most successful albums of all time," says Michael Vrionis, President of Universal Tone Management. "Carlos' music is as vibrant and as relevant as it was when Supernatural debuted. Our concerts will showcase the melodies, grooves and brilliance of one of the greatest guitarists of all time, Carlos Santana." Thirty years before Supernatural, Santana mesmerized the then record-breaking audience at Woodstock - the band's performance of "Soul Sacrifice" is regarded as one of the high points of the classic concert documentary. "I'll never forget the way the music sounded, bouncing up against a field of bodies," says Santana. "It's well documented that I was tripping during our performance. At one point the guitar turned into an electric snake, twisting and turning. I kept willing the snake not to move and praying that it stayed in tune. By the time we played 'Soul Sacrifice,' I was able to breathe and focus, and the band crystalized as one. The magic of Woodstock would not have been possible without Bill Graham. No one had heard of us yet, but he made sure we were on the bill. He is always in my heart." 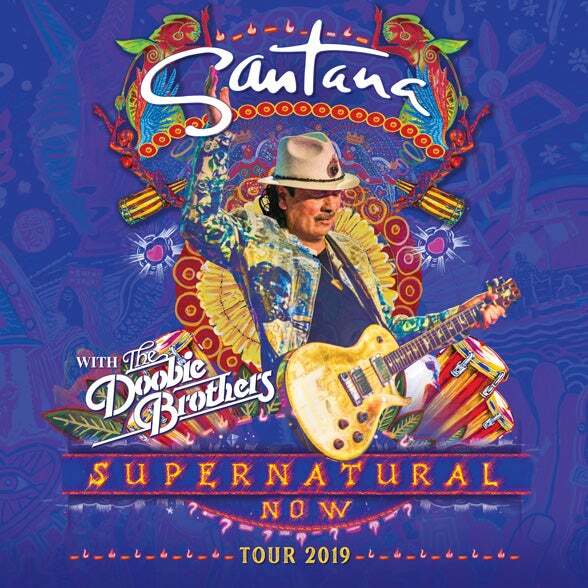 While Santana will highlight songs from both his Supernatural and Woodstock eras on the Supernatural Now tour, the guitarist says that the set list won't be a dedicated nostalgia trip. The band (which also features Santana's wife, Cindy Blackman Santana, on drums) will perform new tracks from Santana's soon-to-be released EP, In Search of Mona Lisa (due out January 25), as well as a much-anticipated, upcoming full-length produced by maverick hit-maker Rick Rubin. Carlos Santana recently signed with Concord Records, which will release both discs. "We're always moving forward, and we have incredible new songs and melodies that will inspire you," says Santana "I feel like a 20 year old on stage playing with this band, and they deliver on every song. When we hit the stage, we know we will touch your heart and make you dance, sing, cry, laugh and leave your baggage behind. The shows will be well balanced between the hits of yesterday, today and tomorrow...with energy!" The original Woodstock festival took place between August 15-19, 1969. Santana reflects, "It is an honor to celebrate the anniversary of this historic event and return to that sacred ground once again in August. I have a lot of ideas about the anniversary and how to honor those who are no longer with us to celebrate. It is going to be an inspiring summer and we invite you to join us and celebrate life!" To reward Santana's loyal fans for years of support and in celebration of the 20th anniversary of the award-winning album Supernatural, Carlos would like to share his latest masterpiece, a new full-length album of highly energetic and hypnotic songs, rhythms, melodies and grooves from Santana. Each pair of tickets purchased for this historic tour will receive this wonderful collection of new music as a special bonus. For more information, please visit santana.com. 2019 marks the 20th anniversary of Carlos Santana's groundbreaking album Supernatural and the 50th anniversary of his legendary performance at Woodstock. To date, Santana has won 10 Grammy Awards and three Latin Grammys. He won a record-tying nine Grammys for a single project for 1999's Supernatural (including Album of the Year and Record of the Year for "Smooth") as well as three Latin Grammys. He has also received the Billboard Century Award (1996), was ushered into the Rock and Roll Hall of Fame (1998), received the Billboard Latin Music Awards' Lifetime Achievement honor (2009), and was the recipient of the Kennedy Center Honors Award (2013). Among many other honors, Carlos Santana has been cited by Rolling Stone as No. 15 on their list of the "100 Greatest Guitarists of All Time." In the fall of 2014, Carlos Santana released his memoir The Universal Tone: Bringing My Story to Light. Santana is currently headlining a multi-year residency at House of Blues at Mandalay Bay Resort and Casino in Las Vegas. The Doobie Brothers have been delivering mind-blowing, roots-based, harmony-laden, guitar-driven rock and roll for over four decades, selling more than 48 million albums and winning four Grammy Awards. They released their latest album, Southbound, in November 2014 on Arista Nashville. Southbound features new recordings of the band's biggest hits, with country music's biggest stars including Blake Shelton, Zac Brown Band, Brad Paisley and Toby Keith. Boasting one of the most loyal fan bases in music, the band continues to write and record new material and tour the world. Their No. 1 singles "Black Water" (1974) and "What a Fool Believes" (1979), both gold, lead a catalog of indelible songs that include: "Listen to the Music," "China Grove," "Jesus Is Just All Right," "Rockin' Down the Highway," "Long Train Runnin'," "Take Me In Your Arms," Takin' it to the Streets," "Minute by Minute," "You Belong to Me," "The Doctor" and more. In all, the Doobies have tallied up five top 10 singles and 16 top 40 hits. Beginning with their multi-million-selling sophomore collection Toulouse Street (1972), the Doobies have 3 multi-platinum, 7 platinum and 14 Gold albums. Their Best of the Doobies (1976) has sold more than 12 million copies - a rare "diamond record."